Do not leave any objects (screwdrivers, tools, etc.) on the seat during seat repair. It can lead to personal injury if the side air bag module should accidentally deploy. When removing or installing the seat trim, handle it carefully to keep dirt out and to avoid damage. Do not drop, tilt, or bump the side air bag module while installing the seat. Always handle it with care. 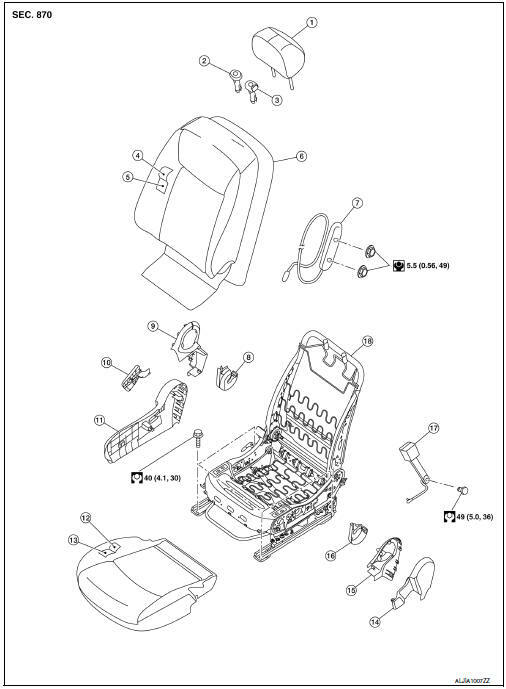 After front side air bag module inflates, the front seatback assembly must be replaced. When removing and installing the seat, use shop cloths to protect components from damage. Before removing the front seat, turn the ignition switch OFF, disconnect both battery cables and wait at least three minutes. Disconnect the negative and positive battery terminals and wait at least three minutes. Refer to PG-50, "Removal and Installation (Battery)". Slide the seat to the full forward position. Remove the two rear seat bolts. Slide the seat to the full rearward position. Remove the two front seat bolts. 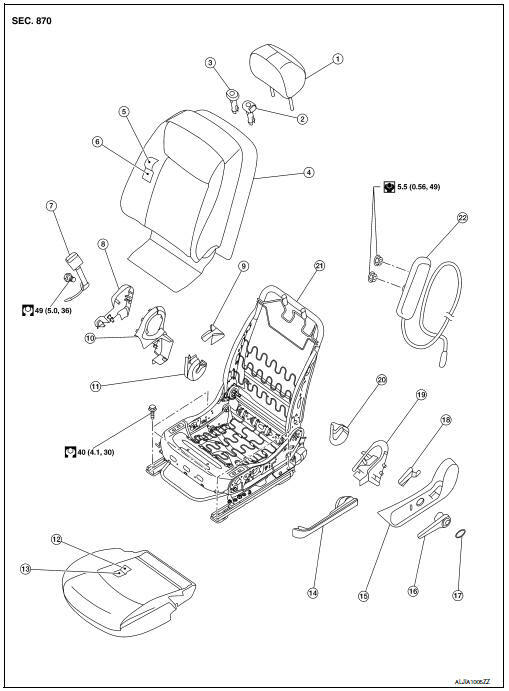 Make sure that the seat harness or the floor trim is not damaged during installation. Front passenger seat is equipped with an Occupant Classification System sensor and control module. 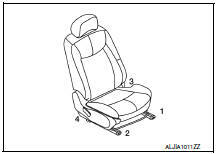 Do not disassemble front passenger seat cushion assembly or remove the trim as this will affect the Occupant Classification System calibration. Before removing the front seat, turn the ignition switch OFF, disconnect both battery terminals and wait at least three minutes. Disconnect the negative and positive battery terminals and wait at least three minutes. 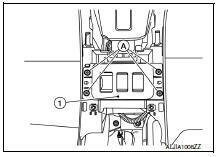 Refer to PG-50, "Removal and Installation (Battery)"
Tilt the seat rearward to disconnect the harness connectors from the seat and remove. 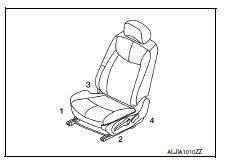 Perform additional services when installing front passenger seat. Refer to SRC-41, "ZERO POINT RESET : Description". Zero point reset must be performed every time the front passenger seat is removed from the vehicle. Zero point reset is done after the front passenger seat is installed in vehicle and all bolts are tightened to specification. When installing the RH front seat, tighten the bolts in the order shown. 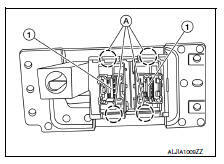 Remove the screws (A) and the front heated seat switch finisher (1) from the center console assembly. Disconnect the harness connectors from the front heated seat switches. Release the pawls (A) using a suitable tool and remove the front heated seat switches (1) from the front heated seat switch finisher.